It’s both the bane of many parents and what has been called a major national vulnerability: the inability of many children to understand mathematics. Understanding that problem and developing strategies to overcome it is the research focus of Nicole McNeil, Alliance for Catholic Education (ACE) Associate Professor of Psychology at the University of Notre Dame, and the researchers in her lab. A new paper by McNeil and Emily Fyfe, a former Notre Dame undergraduate who’s now a doctoral student at Vanderbilt University, examines if the labels educators use to identify patterns affects preschoolers’ understanding of patterns. Members of the CLAD (Cognition, Learning and Development) Lab that McNeil directs at Notre Dame recently collaborated with Fyfe and other colleagues at Vanderbilt University to examine if the labels educators use to identify patterns affect preschoolers’ understanding of patterns. They compared concrete labels, which refer to the changing physical features of the pattern (e.g., “red, white, red, white”), to abstract labels, which describe the pattern using an arbitrary system that mimics the pattern (e.g., “A, B, A, B”). Children in the study solved a set of patterning problems in which they watched an experimenter explain a model pattern using either concrete labels or abstract labels and then tried to recreate the same pattern using a different set of materials. This research result converges with several other findings from McNeil’s lab in recent years that have shown that relatively minor differences in the structure of children’s input can play a role in shaping and constraining children’s understanding of fundamental math concepts. Although the McNeil lab’s research is primarily focused on mathematics, the results may possibly be applicable to other areas of learning such as reading and spelling. The research paper appeared in the journal Child Development. Fyfe’s research was supported by a National Science Foundation Graduate Research Fellowship. McNeil, along with colleagues at the nonprofit research agency West Ed, also recently received a $3.5 million grant from the U.S. Department of Education’s Institute of Education Sciences, which aims to improve students’ mathematical achievement in elementary school and beyond. 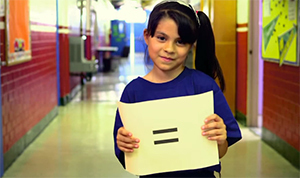 The lessons and activities she proposes for elementary schools to change students’ learning about mathematical equivalence have been used successfully at Santa Cruz Catholic School, a Notre Dame ACE Academies school serving inner-city children in Tucson. Several second-grade ACE teachers from around the country served as participants in the pilot study and helped refine McNeil’s approaches. Originally published by William G. Gilroy at news.nd.edu on May 26, 2015.